Zell Millard sat with a smile on his face as the group of college students belted out a song just for him. It was a familiar tune, with just a little tweak swapping the word “girl” for “guy.” He and others sitting in the dining area at The Heritage at Meridian Gardens, where tables were draped with red cloths, clapped as the rendition of “My Girl” concluded. Veronica Velder then presented Millard with a flower and a card signed by the members of Central Community College-Columbus’ singing group Spectrum. The stop at Meridian Gardens on late Wednesday morning was just one in a busy day for the students as they delivered singing valentines. Students fulfilled about 30 orders from individuals who signed up to have their loved one serenaded by Spectrum. It was the first year the group tried singing valentines, an idea director Jeff Kitson said he got talking to some of his colleagues. “It’s about getting out in the community and spreading love,” Kitson said. The orders were fulfilled over the phone or in person. For a few extra dollars, the recipient also received a flower and personalized card. Terry Millard put in the order for Spectrum to visit Meridian Gardens, where his father Zell, 95, resides. While at the assisted living facility, the students sang to a group of residents who were eating lunch and to Terry Millard’s wife, Beth, who was with him on the visit. Spectrum members said the busy day, which started at 8:30 in the morning and lasted until about 4 p.m., was enjoyable. What they liked most was seeing the reaction from recipients of the singing valentines. “I like bringing something to someone, especially something unexpected. With this being the first year, this is something no one is expected to get on Valentine’s Day. That makes it special,” said Shiyanne Delp, a sophomore from Columbus. Other places the group visited included schools, where they sang to teachers and students, and to Versatile Support Services that helps people with disabilities. That was where the Spectrum members said they got their most memorable reaction. “All the smiles and the clapping, it was fantastic,” said Osceola sophomore Levi Klein, who was decked out in black slacks and a shirt with a red tie. “We could tell we really made their day and made them feel special,” the sophomore from O’Neill said. 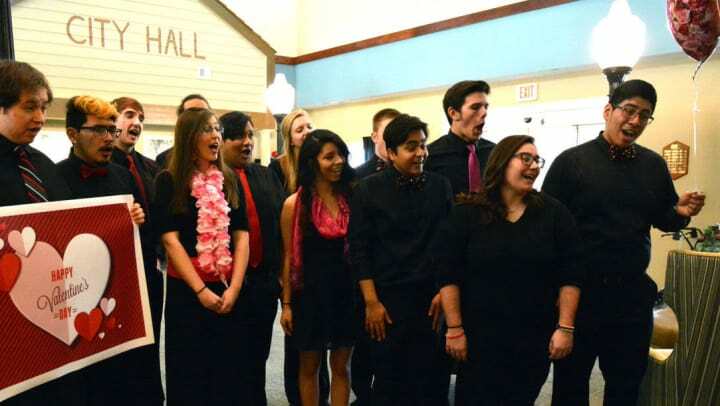 Spectrum is a select singing ensemble that has performed at Carnegie Hall and the Vatican. The singing valentines was a fundraiser for the program. Customers could order one of three packages. One was for a singing valentine to be delivered to a person on campus, another was for a song to be sung over the phone and the other was a song, card and flower to be delivered in person. “We got the music before we left for Christmas break so we practiced then. When we got back from break, it just all fit together because we practiced,” Velder said. Spectrum members hope this won’t be the last time they get to spread a little happiness on Valentine’s Day. “This is all very new and exciting. It’s a really cool thing to do. Honestly, it doesn’t take that long to do each one and it’s a really good little fundraiser for us,” Klein said.